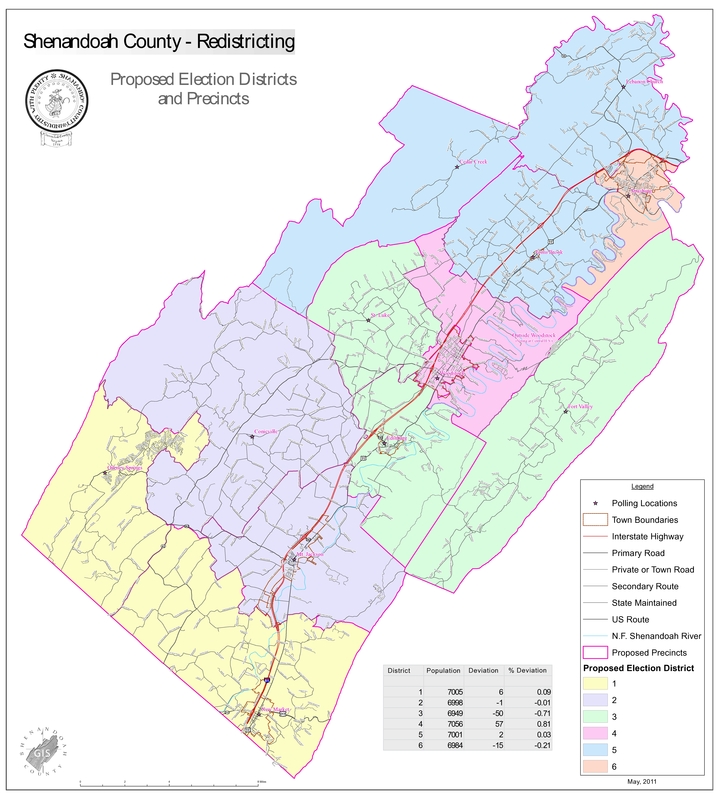 As mentioned previously, it is done: redistricting is complete for Shenandoah County. Alot of little changes here and there in terms of precinct lines–well, depends on if you live in a precinct that’s closing. Mt. Olive, Forestville, Columbia Furnace and Signal Knob will be closing, but by and large voters in those precincts will stay in their supervisor districts. The biggest change is for District Three, which will be picking up Fort Valley as a precinct in addition to St. Luke and Edinburg. The practical effect of this is that Fort Valley voters will be voting for a supervisor for a second time in two years in November. Curious about where you fall? Use the map above to figure it out. One thing about the map–Riverbends precinct was NOT created, so all those voters will not only vote at Central High School alongside Woodstock town voters but will be a part of the precinct proper. Essentially, the proposed Riverbends precinct would have been an administrative move more than anything else–there would have been a seperate set of pollbooks and officials for Riverbends, but they would’ve voted in the same place. Now, don’t worry about that–if you’re in District 4 according to the map, you vote in Woodstock and are part of that precinct. A bigger implication–those voters who were moved from Mt. Olive to Woodstock are now entitled to vote at the Republican Mass Meeting and attend the County Convention as delegates from Woodstock. So again, figure out where you vote (click on the map to make it larger) and get involved. Still not entirely sure where you vote? Contact the Registrar’s office, or wait for your new card to arrive sometime around September.